Today was day 19 of 20 days in a row of working mostly 12 hour days or more. I’m exhausted and a little sick with a cold. This heavy workload of a full-time job and Yoga-urt does take a toll on me which is probably why I’ve been sick twice in the last few months. This last month has been a hard one. I’ve been challenged in so many ways. Most of them are typical problems of owning a small business and getting through your first year, which everyone says is the hardest one. The biggest stress is that we are headed into the slow season for frozen yogurt and money is tight. This is not surprising but a reality that I face. I will do the typical things that a business owner needs to do in these times, and we will make it work, but it’s not easy. I am so thankful to have my day job right now. It is a demanding job on a crazy project, but I would not be able to make Yoga-urt work without it. Faith. That is what I have to keep reminding myself to turn to – faith and not fear. My whole journey has been a leap of faith, and in the last few days, I’ve been reminding myself to keep the faith. I know that I am supported and this is all part of my journey. There may be bumps at times, but I knew this was not going to be easy. I’m so grateful for my family and friends who support me, for the Yoga-urt team members who work so hard, and for the community that has shown up for Yoga-urt. 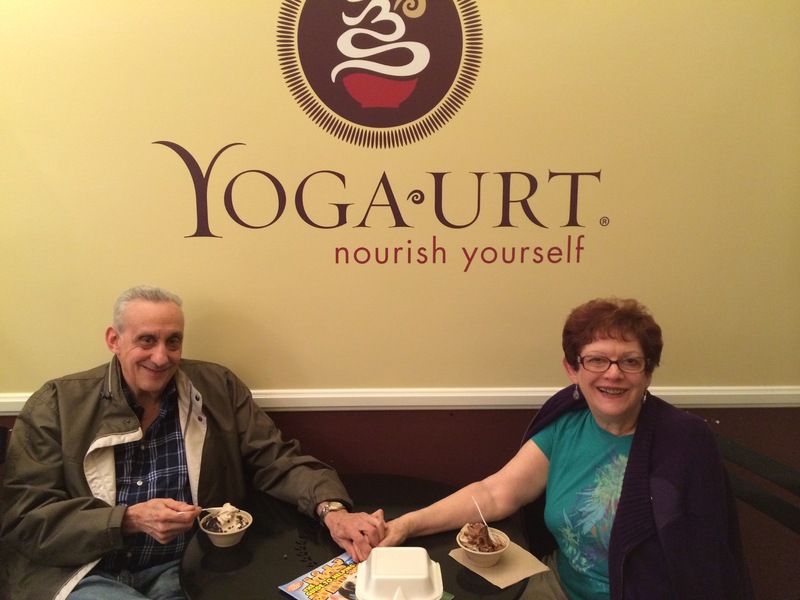 My parents came to Yoga-urt on Sunday, and they always have a great time when there. My mom likes to tell everyone that her daughter is the owner and they love watching people enjoy themselves (as do I). They even took a pint home with them, were eating it last night, and told me how good it was. That makes me so happy. The thought of my parents eating my soft serve/ice cream in their home and loving it makes me very proud. I need to remember to breathe through the challenges, make the best decisions that I can, and know that I am supported!